In this week’s Torah Portion, we read the following, Bereshit / Genesis 19:21, כ וַיֵּרֶד יְהוָֹה עַל-הַר סִינַי אֶל-רֹאשׁ הָהָר וַיִּקְרָא יְהוָֹה לְמֹשֶׁה אֶל-רֹאשׁ הָהָר וַיַּעַל מֹשֶׁה: כא וַיֹּאמֶר יְהוָֹה אֶל-מֹשֶׁה רֵד הָעֵד בָּעָם פֶּן-יֶהֶרְסוּ אֶל-יְהוָֹה לִרְאוֹת וְנָפַל מִמֶּנּוּ רָב: כב וְגַם הַכֹּהֲנִים הַנִּגָּשִׁים אֶל-יְהוָֹה יִתְקַדָּשׁוּ פֶּן-יִפְרֹץ בָּהֶם יְהוָֹה: 19:20 The Lord came down on Mount Sinai, to the top of the mountain; and the Lord called Moses to the top of the mountain, and Moses went up. 19:21 Then the Lord spoke to Moses, ‘Go down, warn the people, so that they do not break through to the Lord to gaze, and many of them perish. 19:22 ‘Also let the priests who come near to the Lord consecrate themselves, or else the Lord will break out against them.’ (NASB) Have you ever wondered what it is about breaking forth and looking upon the Lord that is a death penalty? Rashi states the following concerning these things. ונפל ממנו רב AND MANY OF THEM FALL — whatever of them it may be that falls, even though it be a single person only, will be regarded by Me as רב, many (cf. Mekhilta d’Rabbi Yishmael 19:21). פן יהרסו — The term הרס, “breaking down”, always denotes the separation of the collection of parts that constitute the edifice. Similarly those who depart from the position which people have taken up break down that position. For those who love the Lord, we long to see Him face-to-face. Having the opportunity as we see here in the text it is not surprising that some would want to get closer to see God, 19:18 Now Mount Sinai was all in smoke because the Lord descended upon it in fire; and its smoke ascended like the smoke of a furnace, and the whole mountain quaked violently. (NASB, יח וְהַר סִינַי עָשַׁן כֻּלּוֹ מִפְּנֵי אֲשֶׁר יָרַד עָלָיו יְהוָֹה בָּאֵשׁ וַיַּעַל עֲשָׁנוֹ כְּעֶשֶׁן הַכִּבְשָׁן וַיֶּחֱרַד כָּל-הָהָר מְאֹד:) Rashi draws out a point in the text in relation to breaking forth to see the Lord God Almighty. The warning was not to go near to the mountain to see God because this would bring death. Rashi states that this breaking down (יֶהֶרְסוּ) or the going forth is synonymous to departing from a strategic position which is the same as breaking down that position. The point seems to be related to the consecrating of one’s self, taking up a position of recognizing the holiness of God and waiting upon Him to come. The command not to break forth may be in the sense of holiness and obedience to God as opposed to unholiness and disobedience to God. There is definitely a connection here to sin and righteousness in relation to seeing God and death. The going forth is doing so according to our ways, to gaze upon the Lord as opposed to obeying God and walking in His ways. This interpretation is consistent with the Mekhilta d’Rabbi Yishmael on Shemot / Exodus 19:21 Part 1 which states “(Exodus 19:21) ‘And the L rd said to Moses: Go down and warn the people:’ lest they break their bounds to see. “and there fall of them many”: If one of them falls, it is (to Me) as if all have fallen; the one detracts from the many. One of them who falls is reckoned against the entire act of creation, viz. (Zechariah 9:2) ‘for to the L rd (will be) the eye of (one) man and (it will be reckoned as) all the tribes of Israel.’” The Midrash speaks of “breaking their bonds” where each man supports the other in faith and faithfulness. The idea of the one who falls is reckoned against the entire creation, is a midrashic way to say that one man is an entire world, and if one is fallen, it is as if an entire world has fallen. This is also another way of describing how the righteous sustain, or warrant the existence of this world and prevents this world from utter destruction. The idea is that Moshe had ascended and spoken with God (i.e. the days of Noah analogy). He had initially told the people not to approach the mountain. God told him to descend and command the people not to ascend and then Moshe and Aaron are to ascend the mountain again. Moshe descending and speaking to the people was coupled with his telling the people to sanctify themselves for on the third day the Lord God Almighty Himself was going to descend upon the mountain. Note how this warning not to breach the fence was a greater violation than the disobedience of many other commands which does not carry the death penalty. It is important to note how both Moshe and Aaron were included in the command not to try and ascend on their own. It was only upon God’s calling were they to ascend up the mountain. Moshe needed to descend because of this point and then bring Aaron with him to draw near to hear the voice of God. Attempting to draw near to hear the voice of God on our own is a violation of the prohibition to not touch the mountain. פן יהרסו אל ה׳ לראות, “lest they break through unto the Lord to gaze;” The Torah means that people should not think that they would catch a glimpse of G’d though they would die in the process; Psalms 63,4 expresses this thought succinctly when David says: “it is better to experience Your faithfulness than life itself.” The people would consider their death under such circumstances as the beginning of their true life. The expression פֶּן-יֶהֶרְסוּ is to be understood as the people’s willingness to lose their lives in order to become part of such an experience as gazing at the glory of G’d. ונפל ממנו רב, “and many of them would fall;” G’d warns that in such a scenario the people would experience a much greater “fall” than they had bargained for. Alternatively, G’d merely warns that if the people would approach to an area out of bounds to them, He would have to reduce the blinding light accompanying the revelation as otherwise they would die from exposure to this light. This then would be the meaning of פן יהרסו אל השם, they would break through towards His light in order to gain a glimpse. This also tells us that the people would not achieve their aim to gaze upon G’d even if they would break through the barrier. It is part of the meaning of the word פן in our verse. In the event that we would have thought that the people’s endeavor to gaze upon something they could not see anyway would have neither positive nor negative consequences, the Torah writes ונפל ממנו רב, that it would have very negative consequences for those concerned. The word רב may refer to the leading members of the people. The Torah would then tell us that even the most spiritually advanced of the people would not be allowed to gaze upon the spectacle but they would be punished severely if they tried. The idea here is that people should not think that they could catch a glimpse of God even though God is unseen. The rabbis say that the people would consider their death the beginning of their true life. The rabbinic commentary makes a very significant observation saying, “The expression פֶּן-יֶהֶרְסוּ is to be understood as the people’s willingness to lose their lives in order to become part of such an experience as gazing at the glory of G’d.” Do you see the significance of this interpretation? The idea here is of dying to one’s self and seeing the glory of God. Notice how Yeshua teaches his disciples this Torah centric principle from Parashat Yitro of dying to one’s self in the following references. Yeshua spoke of taking up the cross and following after him. Taking up the cross is a metaphor for dying to one’s self, dying to sin, repentance, the mikvah (baptism), and turning towards God’s ways of holiness, justice, and truth. Yeshua said in Luke 9:23 one “must” deny himself, die daily, and then he can following him being led by the Spirit of God. So what Yeshua is doing here in these statements is applying a Torah centric principle about the Mountain of Sinai and walking in the Spirit being his disciple. In the Apostolic Writings, the Apostle Paul did not pit the Spirit against the Torah as is the usual Christian interpretation of his writings. To Paul the Holy Spirit and the Torah go hand in hand. Paul did however pit the human physical inclination against the leading of God’s Spirit in Galatians 5:17 (For the desires of the flesh are against the Spirit, and the desires of the Spirit are against the flesh, for these are opposed to each other to keep you from doing the things you want to do.) Our normal mortal human inclinations are errant. Even though we do not want to sin, we still sometimes choose to sin. Our human bodies and minds rebel against God’s authority in our lives. This was what God was worried about in Parashat Yitro in the concept of breaking through and because of the sinful flesh dying. The believer who is trying to following God is at war within his physical behaviors verses the Spirit of God that dwells within. Judaism refers to this as the evil inclination (Yetzer Hara) struggling with the good inclination (Yetzer Hatov). Every human being has a desire to do good and a desire to do evil. Paul went further than that in saying that this evil inclination is part of the flesh. Paul taught that the whole body is in opposition to God. All of the desires of the body are in opposition to the Holy Spirit of God that dwells within. This is what confounds us in our attempts to grow, in our attempts to be better disciples, in our attempts to improve ourselves, and to earnestly repent. Paul told the Galatians to be “led by the Spirit of God.” This is another way to say that they are to submit to the will of God according to His Torah. This is what he meant when he said “But if you are led by the Spirit, you are not under law.” (Galatians 5:18) Paul was saying if you obey God’s will for your life and behavior, you are not being judged by the law (i.e. under the law). Galatians 5:18 does not say that we are not under the authority of God’s commands. Paul uses the term “under the law” as a reference to being judged guilty, and this makes sense writing “But if you are led by the Spirit, you are not judged guilty.” Paul uses this term “being led by the Spirit” as a reference to the Gentiles having obligations to the Torah because this is the Word of God to His people. Note how being led by the Spirit is in opposition to the desires of the flesh. This connects us back to Parasht Yitro and the people standing before the mountain of Sinai in the command not to break through to see the Lord on penalty of death. From a fleshly perspective, the people wanted to experience God by seeing Him. This was why there was a command to not break through, there is a deep spiritual meaning behind these things and is related to the need to die to sin. These things illustrate for us the importance of putting to death sin in our lives in order to see God. The commentary Tur HaAroch on Shemot / Exodus 19:21 Part 1 also draws out a particular aspect of this moment in Israel’s history in relation to Moshe and the people. Notice how the rabbis draw out the significance of the עֲשֶׂרֶת הַדִּבְּרוֹת‬ (Aseret ha’Dibrot), the Ten Commandments, ascending and descending, and the one who stands between the people and HaShem. When Yeshua invoked the statement of the daily need to carry the cross and then and only then would a man be qualified to following after him, he was drawing in this context of being the One who stands between God and mankind and the holiness of God as it is described in the Torah at the Mountain of Sinai. When Yeshua said in John 5:45-47 that Moshe wrote about him, this is the way in which he did so teaching of the One who was to come standing before God on our behalf. One of the most significant statements Yeshua made was from John 5:45 ‘Do not think that I will accuse you before the Father; the one who accuses you is Moses, in whom you have set your hope. 5:46 ‘For if you believed Moses, you would believe Me, for he wrote about Me. 5:47 ‘But if you do not believe his writings, how will you believe My words?’ (NASB) The point Yeshua is making to the Pharisees and religious leaders of his time is that they did not believe the writings of Moshe, and Yeshua said if they had believed Moshe’s writings, they would have believed His words too. Think about this for a moment, what are we taught in the Church today? 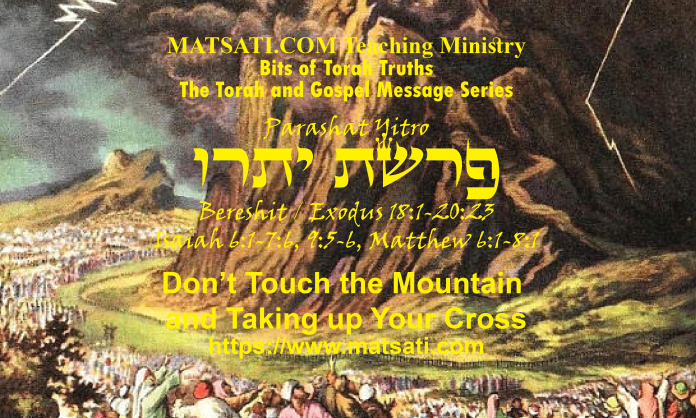 “The Torah doesn’t apply to us now…” The basic premise from that statement is the religious leaders who developed this theology do not believe Moshe’s writings apply to them. This very same thing is what we are seeing today! What we are learning here today is how closely associated the Torah is to the Gospel Message. In fact, if one does not believe Moshe’s words, how are they able to believe Yeshua’s words? This directs us to understand, based upon Yeshua’s words, the Torah is as valid today as it was back in Yeshua’s day for the life of God’s people, both Jew and Gentile. This week’s Torah portion, Parashat Yitro, speaks of the command not to break through to see the Lord God on penalty of death. We learn how this teaches us the importance of putting to death sin in our lives in order to see God. This is why Yeshua the Messiah came to teach us about these things, to help us to overcome this world, and so by faith in Him we receive the Spirit of God into our hearts, who empowers us to overcome sin in our lives for the glory of God! This is how the Torah and the Gospel Message go hand-in-hand!